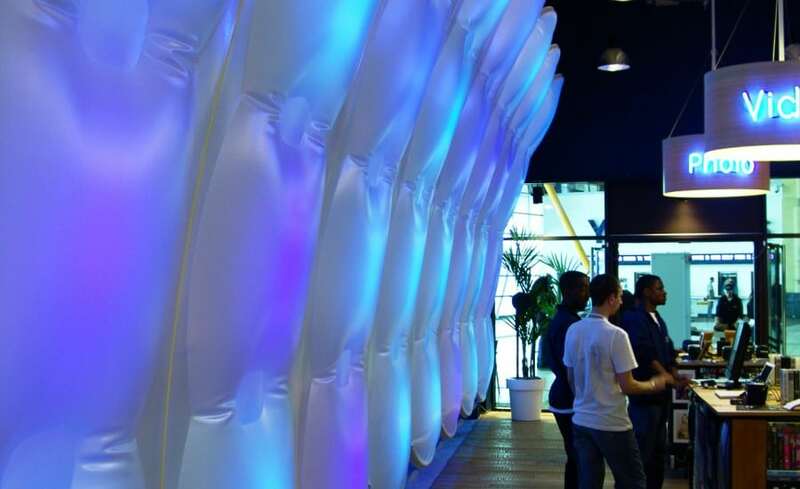 Architen Landrell was commissioned to add a fabric and lighting feature to the O2 store inside the O2! Once the Millennium Dome, one of Londons most famous iconic structures, AEG and O2 have transformed the space into a brand new entertainment centre incorporating shops, restaurants, music and sporting venues. 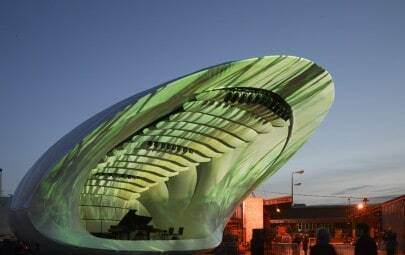 In the entranceway lies a concept store and interactive lounge space for the communications giants to market their services. 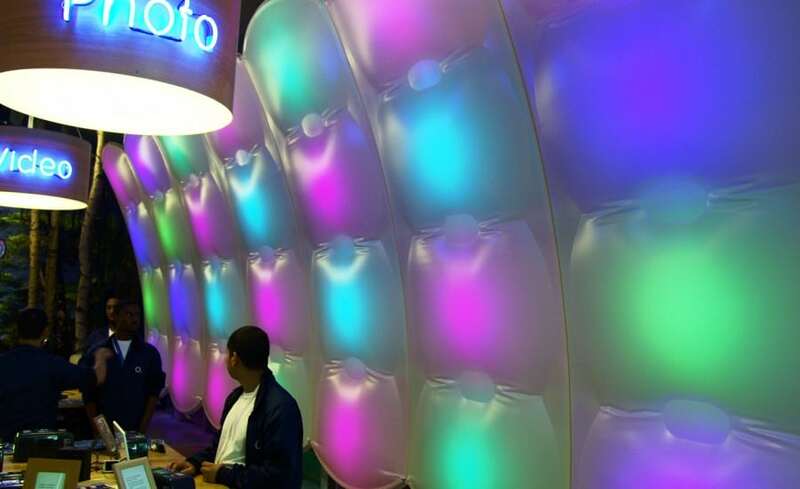 Designers always considered the O2 brand to be soft and tactile and the inflatable colour changing pillows reflect the bubble logo of the mobile phone company. Designed as a tactile and friendly space, fabric seemed the obvious choice to create an environment which reflected this and also contrasted nicely to the conventional modern view of technology represented in chrome, glass and angular shapes. 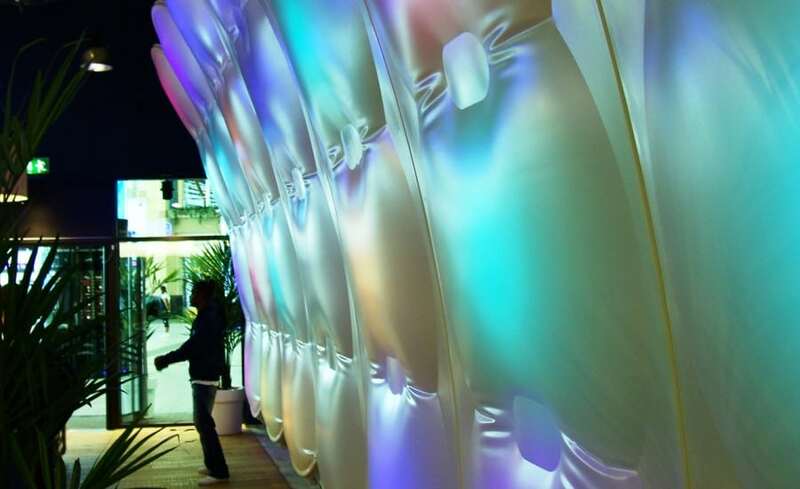 Large, inflated PVC coated polyester pillows were installed over two entire walls and formed the basis of the installation. Architens lighting department then stepped in and lit the pillows with LED colour changers mounted on the frame behind. Proximity sensors located behind each column interact with customers and change the effect of the lighting as people draw near or step away. The funky colour changing pillows help realise the designers desire to create a laboratory space which encourages people to interact with the phones and their environment. 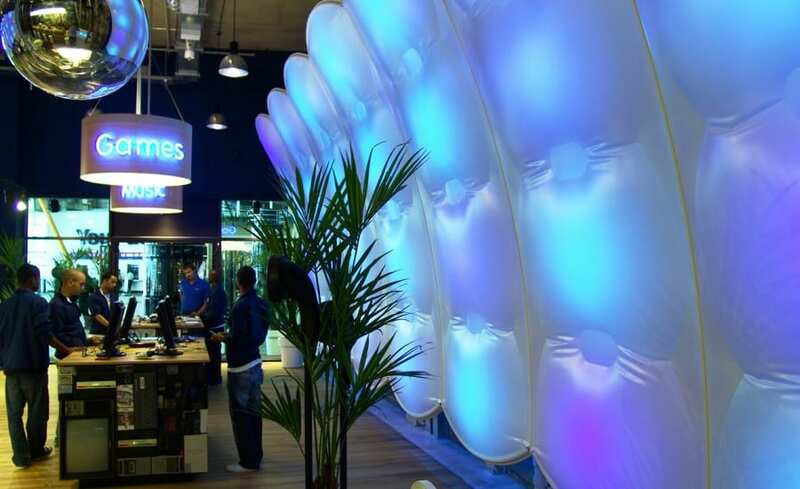 The O2 shop was an entirely innovative design. 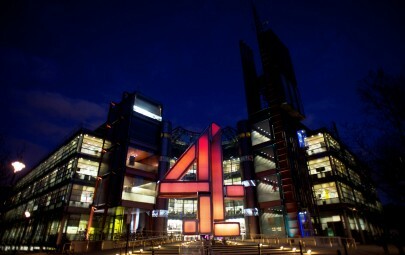 Without being able to fix directly to the floor, the whole installation fabric, lights, steelwork and control systems – had to be suspended from the existing wall. Unlike any of our other projects, the pillows were welded in a particular way to produced the desired wrinkles! A welding tool had to be specially created to ensure this would consistently occur. The client was ecstatic and claims that the interactive wall is the making of the store. Executives and visitors alike have been heading to the store as a place to relax, play and enjoy themselves. 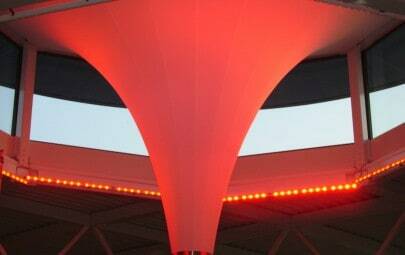 The unique interactive lighting has inspired the designers to integrate it further with the surroundings. They are now talking of tuning the lighting in time with the music to create a graphic equaliser effect!